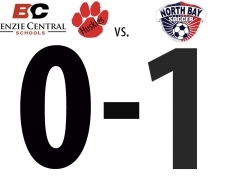 NorthBay took a total of nine shots in the first half. 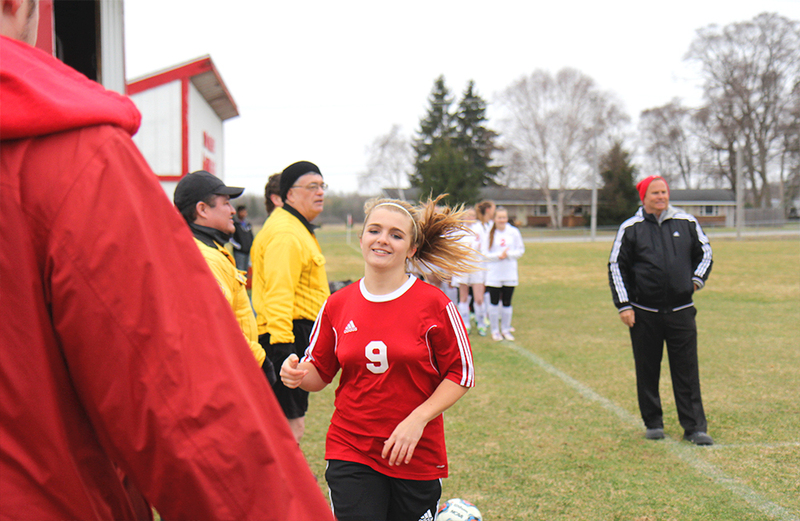 A pair of shots resulted in the only goal that NorthBay scored, when #3 Sydney Deadman scored on a rebound from her own penalty kick. 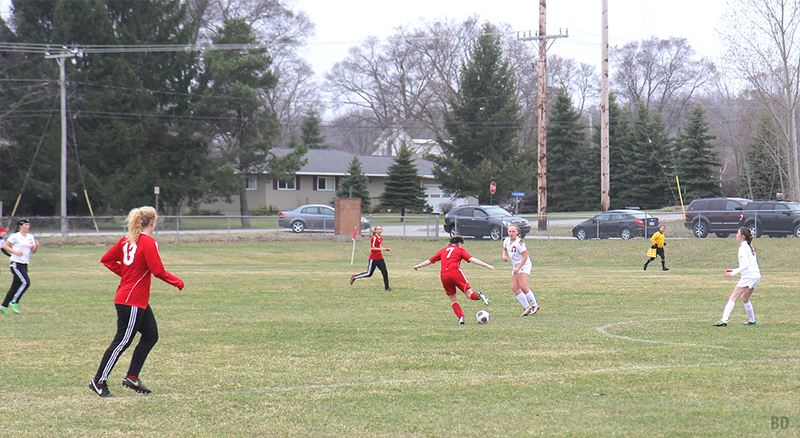 Benzie’s goalkeeper Maile Church was having a phenomenal game, and she made an incredible dive to her right side on the PK and was able to tip the ball out, but our defense was a little slow to run in, and Deadman was able to score off her own rebound. Meanwhile, our Benzie girls took five shots during the first half (four shots by Haley and one by Mimmi Peuhkurinen). However, Benzie took no shots in the second half, compared with 12 shots by NorthBay. 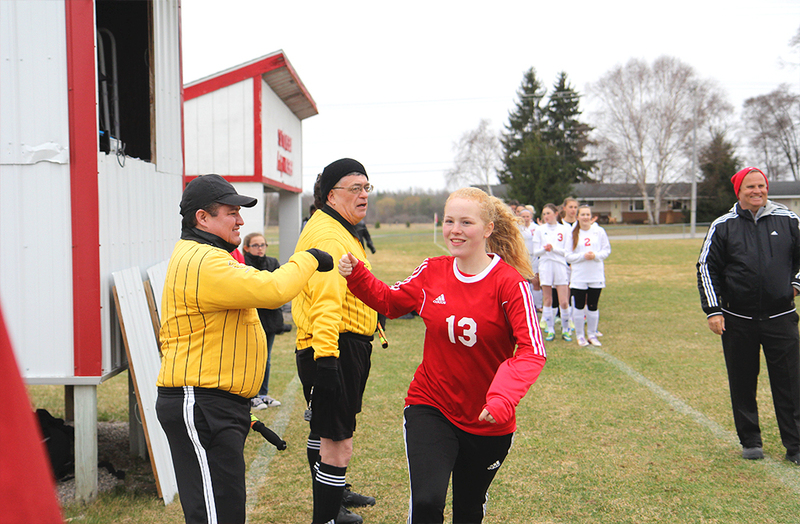 Maile had a total of 28 saves for the game, compared with three saves for NorthBay’s starting goalie, Joan Ogemaw, and 0 saves for their second-string goalie, Alauna Oskaboose, who was put into the game late in the second half. A few things that we need to work on for future games: first of all, wen eed to get into better shape, because it seems like we got really tired in the second half. 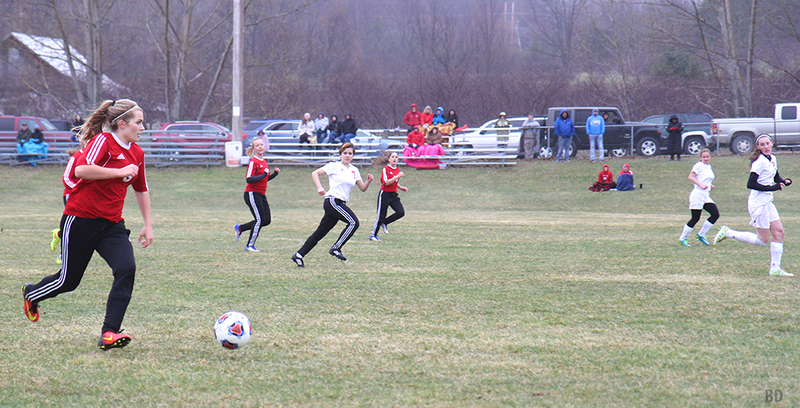 Additionally, we need to work on receiving our goal kicks instead of having them turned over. We need to stop stabbing in on defense, and we need to work on forcing to the outside rather than giving up the center of the field. We continued to play around with positions this game, moving Hanna to center defense, Allie Howell to sweeper, and Haley and Allana Bostick up to forward positions to try to create some offensive plays. Haley had a weird calf cramp that occurred about halfway through the second half, so she had to come off the field, but she was able to go back into the game after stretching it out for a few minutes. 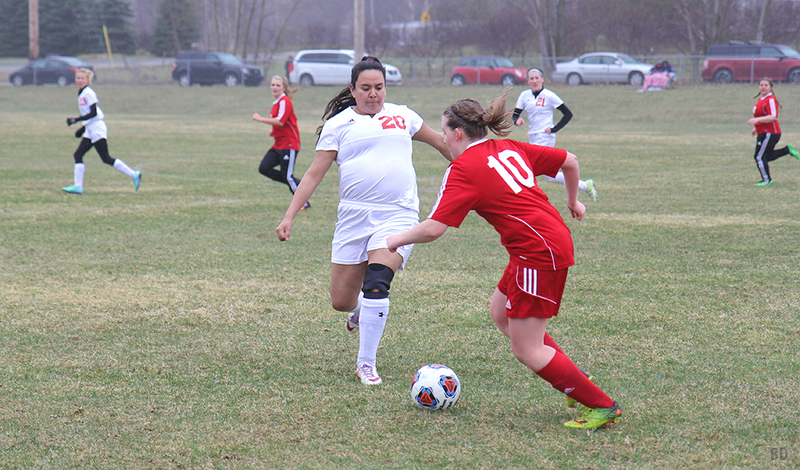 Shortly after that, Kaitlynn Pataky collided with a NorthBay player, body to body, and needed time to catch her breath, because she’d had the wind knocked out of her. When Coach Aubrey Ann Parker went onto the field to check on Kaitlynn, she suspected that Kaitlynn might have a concussion, so she called Kaitlynn’s dad over from the stands and then called the Paul Oliver Memorial Hospital training staff — Adrienne Jones suggested that Kaitlynn go to the Emergency Room at Munson to get checked out. 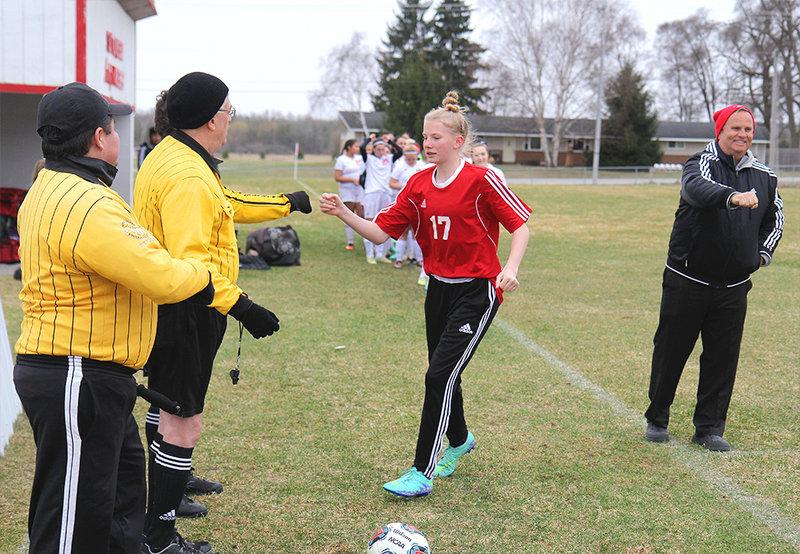 As it turns out, Kailtyn did suffer a mild concussion, so she will have to sit for 7-10 days, until she passes through the MHSAA’s return-to-play protocol. Everyone was able to attend the game, though we had six who were not able to dress out, because our extra jerseys have not arrived (Lucy Straubel, Clara Reed, Brianna Dufrane, AuSable Kreiner, Ashley Winfrey, and Emma Quick). Laura Franklin (Chloe’s mom) brought pasta salad and granola bars for a bus snack; for halftime snack, Margie Clous (Myah’s mom) brought strawberries and Wendy Papineau (Haley’s mom) brought apples and watermelon. Referees were Kevin Avery, Jerry Grieve, and Ricardo Rodriguez.